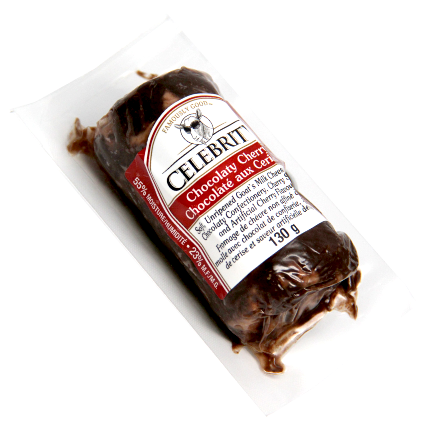 A decadent and luxurious addition to the Celebrity family of goat cheeses, the Chocolaty Cherry Temptation features a combination of sweet chocolate and tart cherries in this delectable treat. Fresh goat cheese is infused with these classic flavors, and then rolled in a combination of dark chocolate bits and dried cherries for added texture. The cheese won awards at both The Royal 2012 and the British Empire Cheese Competition in Canada. This item is SEASONAL for the Christmas season. Applications: Take your favorite chocolate mousse recipe and inject it with a punch of flavor! 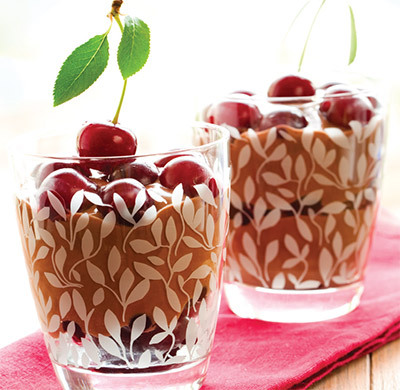 Combine the airy mousse with Chocolaty Cherry Temptation Goat Cheese to add texture and taste to this dessert favorite. Pairings: Try with a crisp Reisling or a malty and fruity Weizenbock.